February 25th is the 56th day of the year in the Gregorian calendar. There are 309 days remaining until the end of the year (310 days in leap years). On this page, we have placed information about February 25th, including famous people born on, historical events that occurred on, holidays and observances that fall on, and astrological connections of, this day. 1836 Samuel Colt granted a US patent for his revolver design. 1870 Hiram Rhodes Revels is the first African-American to be elected to the US Senate. 1901 J. P. Morgan incorporates the United States Steel Corporation. 1913 Sixteenth Amendment to US Constitution, allowing income tax is ratified. 1919 Oregon places a 1 cent tax on gasonline. The first US state to do so. 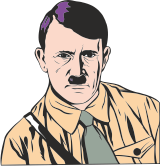 1932 Adolf Hitler obtains German citizenship by naturalization. 1955 Gamal Abdul Nasser becomes Premier of Egypt. 1956 Soviet leader Nikita Khrushchev denounces the cult of personality under previous leader Joseph Stalin. 1991 The Warsaw Pact is declared disbanded.